Do you have a recipe or craft you'd like to share? I love to bake, so every year starting around October -- cause that's ma' birthday month -- I begin baking. I usually don't finish baking until around the Easter holiday. For Thanksgiving and Christmas, I may bake as many as 15 Sweet Potato Pies. It's not unusual to have 3 or 4 cakes sitting on our table. Then I'll make a cake or two for Memorial Day and July 4th. 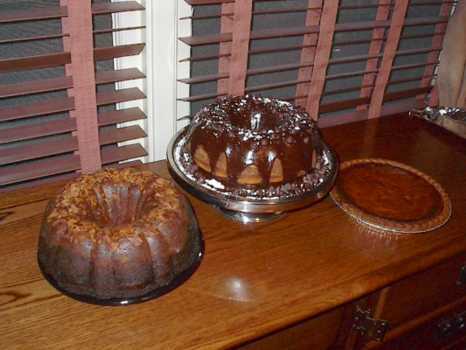 The rest of the year I'm exercising working off the pounds of fat from eating home made cakes and pies. Nothing tastes better that fresh natural ingredients. Pure butter, shifted flower, bakers sugar, large eggs, the best vanilla extract, fine rums, fresh lemon zest, shredded coconut or pecans. A pound cake made from scratch -- there's no starting with the box mix and adding pudding mix. Lemon meringue, beating those egg whites until they peak nice and proper. And cheese cake, yummmm! I'd love to post your favorite recipes, stories of baking or other cooking, or any other type of craft you do.